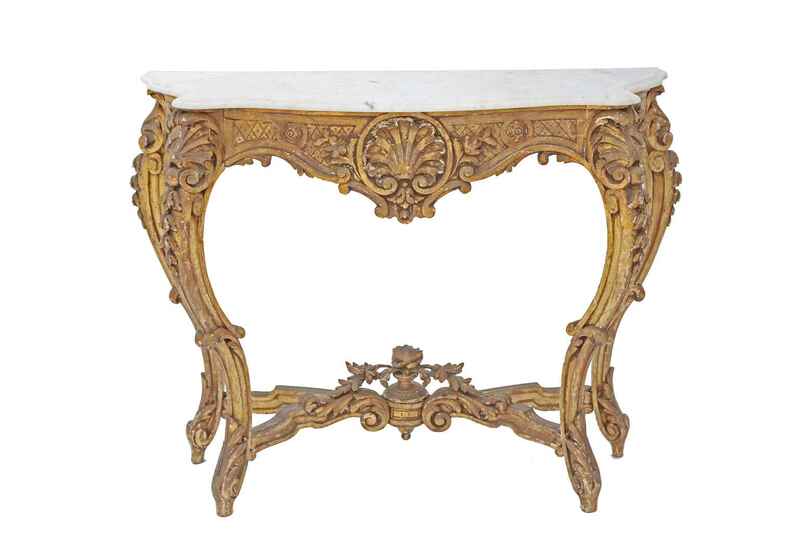 Console table, of carved giltwood, having a free-form top of Carrara marble, its base with elaborate pierced carvings of stylized scallop shell, flanked by laureling, crosshatched motifs, and C-scrolls; raised on four, foliate-carved legs, joined by serpentine stretcher, centered with an acanthus filled urn. CONDITION: Very good antique condition. Desirable wear and minor losses consistent with age and use. Console table, of carved giltwood, having a free-form top of Carrara marble, its base with elaborate pierced carvings of stylized scallop shell, flanked by laureling, crosshatched motifs, and C-scrolls; raised on four, foliate-carved legs, joined by serpentine stretcher, centered with an acanthus filled urn. CONDITION: Very good antique condition. Desirable wear and minor losses consistent with age and use.